Synopsis: With the Death Star being destroyed, the Empire and Darth Vader are out in pursuit of vengence against the Rebel Alliance. While Han and Leia fight the Empire, Luke goes off in search of a Jedi Master to become a Jedi. All the while Vader is in red hot pursuit of Luke. Review: How on earth do you top a film that had a monumental impact on pop culture and changed cinema forever? That was the unenviable task facing the individuals on the production team of the sequel to George Lucas’s phenomenal film. Lucas himself opted not to direct the sequel and the role was passed down to Irvin Kershner. A daunting challenge, but one that he rose to in magnificent style as they helped to make what is, simply put, one of the greatest films of all time. With Lucas’s first film, we got introduced to this glorious and vast world, as well as our group of fascinating and interesting characters that you came to care about deeply. With this second instalment of the original trilogy, it takes both of these and expands on both of them, giving even great depth and development to our protagonists as well as our antagonists, and all the while exploring whole new worlds within this already wide universe. It’s a sequel done right in just about every way imaginable from the script to the directing to the score. It is pure cinematic perfection. As the film’s title may suggest, the tone of this instalment is considerably more darker right from the get go, with the Empire ruthlessly seeking out the Rebels after the Death Star’s destruction. Vader in particular, now with no more Grand Moff Tarkin to hold him back is mercilessly killing the generals who displease him or if they make a grave error, then there is no hiding place. There is no patience nor compassion at all with Vader in his quest to hunt down Luke Skywalker, and this includes torturing Han just for the sake of luring Luke into a trap. It is this mercilessness and pure villainy, as well as his booming voice and his unique breathing, that makes him one of greatest villains in the history of cinema. So many scenes in this film have since become iconic pieces of film-making. For one the, Battle of Hoth with the iconic Imperial Walkers. The first film did boast some extraordinary special effects (before Lucas became obsessed with them) but here in Empire, the effects are just as good and in some cases better. While there isn’t as much action as its predecessor, the action that is on show is as equally mesmerising as the first film. Effects that remain as solid today as they did upon the film’s release almost thirty-five years ago. For instance, the aforementioned Battle of Hoth, the asteroid field, the iconic battle between Luke and Vader, it’s all perfectly well executed. What’s more, this battle as well as boasting some very memorable dialogue, also includes what is quite possibly the greatest movie twist of all time, in which Vader reveals himself to be Luke’s father. It’s brilliant, it’s memorable and it’s one of many reasons why this is the best movie in the franchise, and one of the best movies ever made. The first film introduced us to our awesome ensemble cast, but it is here and through Lawrence Kasdan’s and Leigh Brackett’s screenplay this next chapter goes in a very different direction and goes in some very dark directions, that some directors may have baulked at. The relationships are tested to the extreme and our heroes are indeed in some very perilous predicaments. What’s more, this chapter introduces us to a handful of new and awesome characters, namely Yoda and Lando, The former, undoubtedly one of the best characters ever written, with some absolutely brilliant such as “do or do not, there is no try.” This among others are examples of lines which can and should be used by everyone in their lives at some point. Can we really encase one of our main heroes in frozen carbonite and leave the film on a massive cliffhanger? Yes, yes they could. Can another one of our heroes have his hand chopped off and choose to fall voluntarily to his possible death? Again yes we can. It is bold and brave storytelling, but it is one of the many reasons that makes Empire Strikes Back so memorable. The film is littered with iconic dialogue, but none more so than the scene just before Han is put into carbonite. “I love you,” says Leia, and what should have been ” I love you too” was changed by Harrison Ford to “I know.” A master stroke by Ford and credit to the director for agreeing with the change as it is one of the most emotional moments of the original trilogy. John Williams’s score is again just perfection, and some of the best music ever written and composed for the big screen. It is also the film with the least amount of change in it when compared with the rest of the trilogy. The bar was set very high following our introduction to this world, but Kershner and his team knocked it out of the park and in some style. 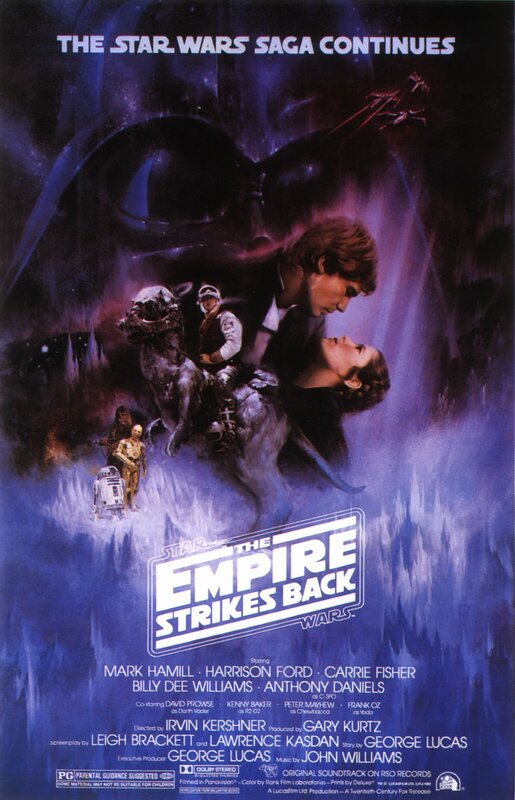 There are no two ways about it, The Empire Strikes Back is cinematic gold. Perfect in just about every way, from characters, script, action, effects, score. The best film in the franchise without a shadow of a doubt.